Development started in 2000, and the flight model was completed in 2002. 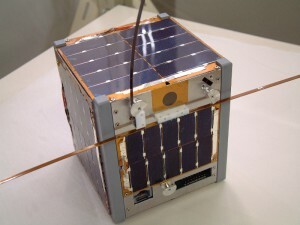 This XI-IV is the first handmade nano-satellite developed by ISSL. XI-IV is the world smallest satellite as of the launch date, which satisfies the CubeSat regulation of “10cm cube and 1kg”. In addition, XI-IV is just 100th satellite put into orbit by Japan. XI-IV was launched on June 30, 2003, from Plesetsk Cosmodrome, Russia. The launching vehicle is named “ROCKOT”, converted from the ballistic missile. This time we made a contract directly with Eurockot, which is the joint venture of Germany and Russia. XI-IV is an amateur satellite using amateur band. The following information would be required to receive data from XI-IV. Aktive, Telemetry AX25 downlink will be performed only when XI-IV is passing above Japan. [UT1 WWW.SPACE.T.U-TOKYO.AC.JP  URL of ISSL. [UT2 AA BB CC]                  Time information. Upper bits of Solar I - each data(4bit)*6=3byte. Q~X is Upper bits(4big) of each data. Q~V: Temperature of each panel. W : Temperature of battery. X : Temperature of FM tramsmitter. GG : Max. of RSSI.